Today was our monthly lia sophia group meeting and my mum, who also sells lia sophia, was working registration. So I walked in the doors of the Doubletree where we have our meetings and the first thing she asks me after hello is if I have my checkbook because she’s forgotten hers. Now, I do not usually carry a checkbook because I am definitely of the plastic generation, but we have this big leadership event coming up in January and I intended to register at the meeting. Therefore, on Monday night I intentionally pulled my checkbook out and put it in my workbag to bring with me to said meeting. So I tell her yes and pull out the checkbook to buy some raffle tickets as well as write a check on her behalf. One problem there are no checks in the checkbook. That’s right. At the beginning of the month when I wrote my rent check I used the last one in the book and never replaced it, so all I had was a plastic bi-fold full of used duplicates and deposit slips. I couldn’t believe it. Here I had had the forethought to actually pack it ahead and there were no checks inside. Not only that, but there’s no ATM at the hotel. I asked. Chagrined at myself, I double check that I can mail my registration in for the leadership event and resign myself to no raffle tickets. Life, after all, goes on. The meeting progresses and I still can’t believe I’ve done this hair-brained thing. We get to the point in the evening of discussing the event and, more as a joke than serious, I tell my mom that I can write them a deposit slip for my registration. 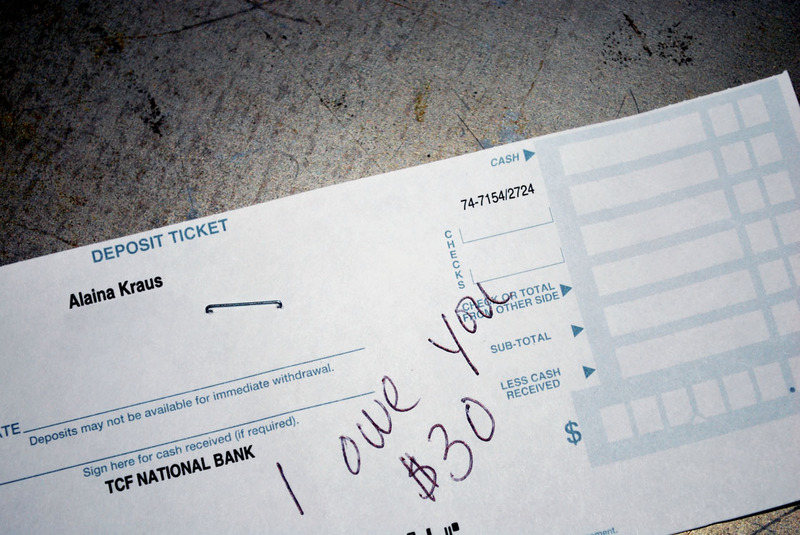 She encourages me to do so with an IOU message on it. I decide to go for it. At least then they have my registration and know a check is coming. I hand in my form, we get a laugh out of it and I return to my seat. The meeting ends and I’m talking with some of the girls when Carol, our Zone Manager, walks over holding my registration in her hand. At first I thought maybe she wanted to let me know she had gotten the IOU. Instead, she pulls the stapled deposit slip from my form, and tells me I don’t owe her because my IOU’d form had been drawn to get to attend for free! In the words of Dr. Horrible, what a crazy random happenstance. So I’ve decided that I’m taking this a good sign for the coming year. In fact, I’m going to hang that deposit slip on my wall next to my to do list and Will Rogers quote as a reminder of good things on days that aren’t quite so blessed lucky. In addition to this my good luck was further evidenced in that I did not hit or get hit by any of the 7 deer and 2 cats who decided they should share the two lane highway with me during the last 10 miles of my drive home. There may have been a conspiracy to see what kind of record they could get on my wild critter sightings in that period of time.